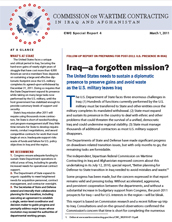 Special Report 4: Iraq — a forgotten mission? 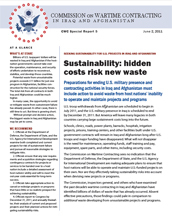 The Commission issued its second Special Report, "Lowest-priced security not good enough for war-zone embassies," to urge that Congress change a statutory restriction on the State Department's ability to choose security contractors for its Foreign Service buildings based on any considerations other than lowest price and technical acceptability. The Commission believes that the unintended consequences of the mandate were illustrated in poor contract performance and widely publicized misconduct by guards for the embassy in Kabul. The State Department is on record saying contractor performance endangered the embassy and its personnel. The report urges allowing use of the "best-value" standard for evaluating contract offers. 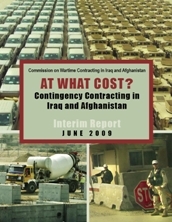 On August 11, 2009, the Commission on Wartime Contracting in Iraq and Afghanistan conducted a hearing to obtain testimony from government officials and contractors on the adequacy of contractor business systems. The Commission learned that unreliable data from business systems produced billions of dollars in contingency-contract costs that government auditors often could not verify. 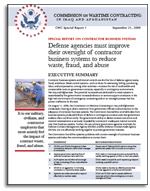 The government’s ability to detect contract cost errors and material misstatements is seriously impeded by contractors’ inadequate internal controls over their business systems. 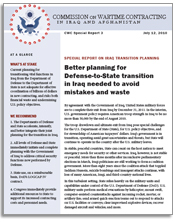 Further, the two primary government agencies involved, the Defense Contract Management Agency (DCMA) and the Defense Contract Audit Agency (DCAA), are not effectively working together to protect government interests. The Commission recommends: (1) Department of Defense (DoD) needs to ensure that government speaks with one voice to contractors; (2) DoD needs to improve government accountability by rapidly resolving agency conflicts on business systems; (3) DCAA needs to expand its audit reports to go beyond rendering a pass/fail opinion; (4) DCMA needs to develop an effective process that includes aggressive compliance enforcement; and (5) DCAA and DCMA need to request additional resources and prioritize contingency-contractor oversight workload. The Commission submitted "At What Cost? 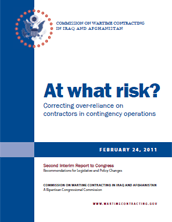 Contingency Contracting in Iraq and Afghanistan" to Congress on June 10, 2009, describing its operations to that date, identifying areas for research, and flagging eight "issues of immediate concern" for lawmakers to consider. 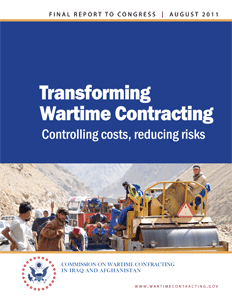 Current law requires the Commission to submit a Final Report in 2010 with findings, lessons learned, and specific recommendations to improve wartime contracting.